Behind Anna are Lions Club representatives Linda Wheele and Sharon Hay and Anna's teacher, Gail Mastel holding the Cecitech Video Book, which is the technology tool Anna needs to make learning truly accessible. The Lions Club, which has a long history of assisting blind or visually impaired persons, donated a Cecitech Viseo Book to Sacred Heart School for the use of Anna, a highly intelligent Grade Three student who is visually impaired. Earlier, this technology was tried for a week to make sure that it is the right tool to make learning accessible to Anna. Priced at nearly $5,000.00, the Cecitech Viseo Book is more than a school can afford for one student, so Sacred Heart School went looking for help, and was thrilled when the Lions Club chose to cover the complete cost. 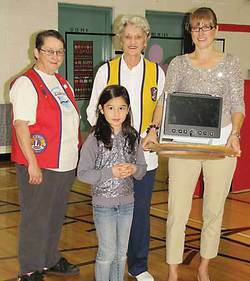 Sacred Heart School is so appreciative and calls the Lions Club “amazing”. The Cecitech Viseo Book has a camera which can be pointed anywhere and puts the image on a screen in a size which allows the user to see it as clearly as possible. This makes material on the board at the front of the class, on posters on the wall, or in books available to Anna. It is cordless and slightly bigger than a laptop, and can make a number of adjustments such as changing contrast. It will open up a whole new way of learning for Anna. Sacred Heart School has a policy of recognizing each child's needs and accommodating physical disabilities. Here there is recognition that different is not bad. When Anna's Grade Two teacher, Gail Mastel, decided to move to teaching Grade Three, it was thought that it would be best for Anna to be in her class, continuing their good relationship. Such caring is the norm at Sacred Heart.